Thorium fluoride, ThF4, is currently the preferred low index material which is transparent from the UV to the IR. Evaporated films are durable and chemically stable and exhibit low stress in thicknesses up to 2 µm. Common applications are for AR coatings in the 8 to 12 µm region, including high power CO2 laser coatings. Thorium fluoride is a naturally radioactive material and must be handled and wastes disposed of in accordance with state and/or federal regulations. In spite of special precautionary measures needed with the use of ThF4, it still is the premier coating material for lasers in the 8-12 µm region. Thorium fluoride evaporates at 800°C. E-beam or resistance-heated sources can be used. When using E-beam, slow, gentle heating is advised. A molybdenum or tantalum hearth is suggested. The recommended substrate temperature is 175°C, with a chamber pressure below 10-5 Torr. A deposition rate of 10 Å/sec. minimum is suggested. A greater rate is possible provided no spitting occurs. Films at least 1000 nm thick are transparent from approximately 250 nm to less than 11 µm. The refractive index in the visible (550 nm) is 1.50. At 10 µm, the index is 1.35. Low substrate temperatures and low deposition rates can cause water absorption bands to appear near 3 µm and 6 µm in the IR. Thorium fluoride can be used as a component in multilayer coatings for AR, bandpass and dichroic filters. The low tensile stress of ThF4 and its good adhesion make it compatible with ZnS, ZnSe, MgF2 and other fluoride compounds. The microstructure of the deposited coating is amorphous, and the films are relatively soft. ThOF2 is a well characterized compound, along with ThF4. However, it has been shown that ThOF2 does not evaporate stoichiometrically, and all resulting films are ThF4. ** Production and Properties of Vacuum Evaporated Films of Thorium Fluoride, W. Heitmann & E. Ritter, Applied Optics, Vol. 7, p. 307 (February1968). Thorium fluoride powder is prepared chemically in a number of carefully controlled steps and melted under inert or fluoride-based atmosphere to yield completely anhydrous ingots. The unequivocal identification of ThF4 is made by X-ray diffraction analysis, where patterns correspond to JCPDS Card No. 23-1426. 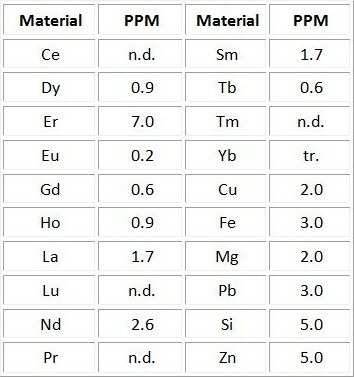 The following table shows typical spectrographic analysis results of ThF4. Thorium fluoride and thorium oxyfluoride are compounds containing naturally radioactive thorium. These radiochemicals emit ionizing radiation, primarily in the form of alpha particles. Thorium and its decay products, called thorium daughters, also emit some beta particles and gamma radiation. 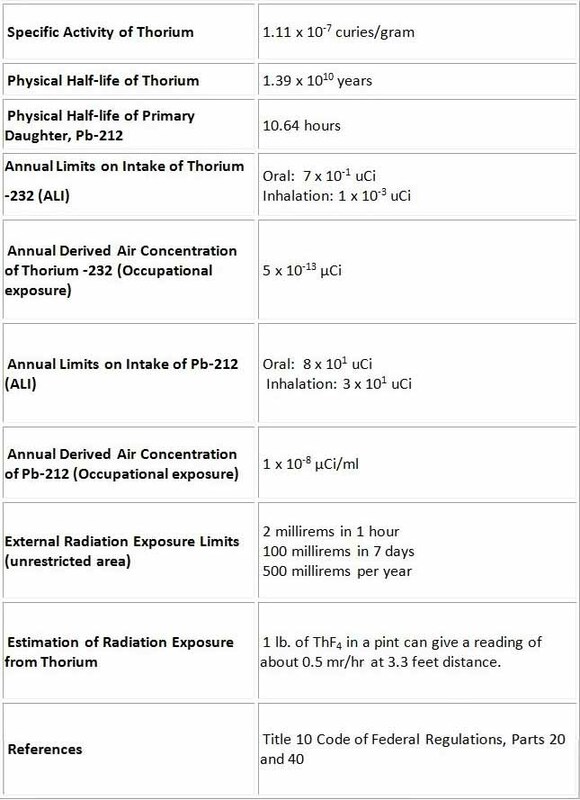 There is low risk of external radiation exposure when handling generally licensed quantities of thorium compounds (150 lbs or less per year and a possession limit of 15 lbs). Radiation exposure to personnel should, however, be kept as low as reasonably achievable. Inhalation or ingestion of all alpha emitters should be avoided. The use of filter masks can be beneficial when the possibility of airborne particulate radiation exists. Materion has an ongoing R&D program to produce completely non-radioactive coating materials to replace thorium fluoride in as many applications as possible. More information is available by clicking CIROM-IRX™. Please contact our sales representatives to discuss your individual coating requirements as they relate to ThF4. Materion manufactures one of the world's largest selections of coating materials and can produce nearly any desired non-standard coating material. View information on our optical coating materials. In addition, numerous materials for evaporation as well as sputtering targets of various compositions can be found on the Materion online catalog. If you require a custom manufactured item, please CONTACT US. Click to view more information about Materion thorium compounds. Note: Facts pertaining to properties and processing parameters of ThF4 were derived from published literature and testing sources. Although this information is believed to be correct, Materion does not guarantee its accuracy. Details on Radioactivity & Safety are from current NRC regulations at the time of this printing.